DAILY EXPRESS front page: MADELEINE: Parents are to sue over claims they gave her fatal overdose. (Plus page 7, with logo: THE HUNT FOR MADELEINE: Day 120). THE WORLD’S GREATEST NEWSPAPER brings the news that the McCanns’ legal action is against the Portuguese publication Tal & Qual. (The Express, of course, has dutifully repeated all the allegations and smears that have emanated from the Portuguese press, for the delectation and disgust of Maddywatchers back home.) Spokeswoman Justine McGuinness says the McCanns “are not going to be a doormat any more”. Meanwhile, the paper says the hunt has switched to a campsite in the Loire valley after sightings by holidaymakers. The Telegraph reports that the McCanns say they are suing to clear their name, not for the money. The paper says that Madeleine’s classmates “said a poignant prayer” yesterday, on what should have been her first day at school. 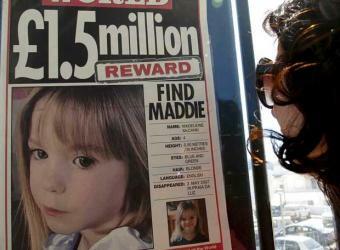 The paper says the McCanns believe it is time to stand firm against the allegations. The paper says the McCanns spent a quiet day with their twins in Praia da Luz. The paper also reports on the candle that is being kept burning at the school. THE INDEPENDENT and THE GUARDIAN: No Madeleine news today.